This page provides you with Physiotherapist resume samples that you can use for inspiration in writing your own resume, or for creating one through our easy-to-use resume builder. Below you'll find our how-to section that will guide you through each section of a Physiotherapist resume. Physiotherapy is a job market that is expected to grow exponentially in the coming decade, but with more and more professionals vying for the highest salary and most influential positions, having a well-crafted physiotherapist resume is crucial to success. If your dream is to become that next lead physio for your favourite sports team, or start your own private practice, our physiotherapist resume samples will inspire you and will help you get there: join the other 3 million prospective professionals in reaching your career potential today, with VisualCV. Put as much attention into crafting the perfect physiotherapist resume as you would treating the recovery of a knee replacement for your most frail client. Use a reverse-chronological format to highlight your career highs, with extra focus on job-specific skills. When actually writing your physiotherapist resume, use clear font like Arial, lots of white space around the information, and big headings. Last but not least, export it in PDF to make sure everything is in order when it is viewed by recruiting professionals. This is where your big wins in the physiotherapy world come into place. Make this section count if you’ve got experience in rehabilitation, or using specialist techniques like electrotherapy or ultrasound. Professional and licenced Physiotherapist with 5 years experience working in rehabilitation for elderly patients recovering from injury. Consistently scored 99% approval ratings from core client base, which numbers 40 monthly patients. Seeking to leverage specialised experienced to move into hospital environment. Professional Physiotherapist with lots of experience working with old people. Wish to move into hospital role to further career. You can use our resume builder for tips and examples on how to write the best physiotherapist resume. This section is best used as an objective statement if you’re a junior level physiotherapist or just out of university. By listing your goals and any transferable skills you can show recruiters that you are motivated to continue your professional practice. Professional sports physical therapist with 3 years part-time experience assisting football team members in physical rehabilitation. Worked on-site during their premiership season, and commended by management for promptness of response and effectiveness of treatment. Looking to leverage sports therapy experience through moving into permanent physiotherapy role with your company. Entry-level sports therapist with experience working with a sports team. Assisted players with injuries and provided managers with assistance. Your professional work experience section is where you can make your resume really pop. Whether you’ve got specialised experience providing inpatient and outpatient rehabilitation services for infants and children or are just starting your first assistant role, we’re here to help. Have you designed efficient patient assessment that has cut waiting times substantially in your practice? Have you got a proven success rate in muscle re-education in elderly patients? Make this experience count! Then, start with the company name, your position and dates. After this could can highlight your professional achievements and skills acquired. Physiotherapist Resume with no experience: If you’re a junior physical therapist or have just graduated, try taking on some voluntary experience in a medical centre or sports facility to hone your skills. Transferable experience like massaging clients after operations is perfect to include here. You can look at our resume guide for information on writing your physiotherapist work experience section. It’s fundamental that professional physiotherapists not only have a tertiary qualification, but the licence to match. Additional training courses and programs like Hip Joint Impingement, Acupuncture, Hydrotherapy, and Kinesiology can all be added to this section to boost your credibility. The foundations of your career as a physiotherapist depend on your technical and soft skills. Refrain from including generic lists, and instead mould them to the job at hand. Soft skills are all about your interpersonal qualities, whereas hard ones are about specifics. To write the perfect physiotherapist cover letter, you can follow our simple tips here. It can help convince recruiters that you’re perfect for the job! 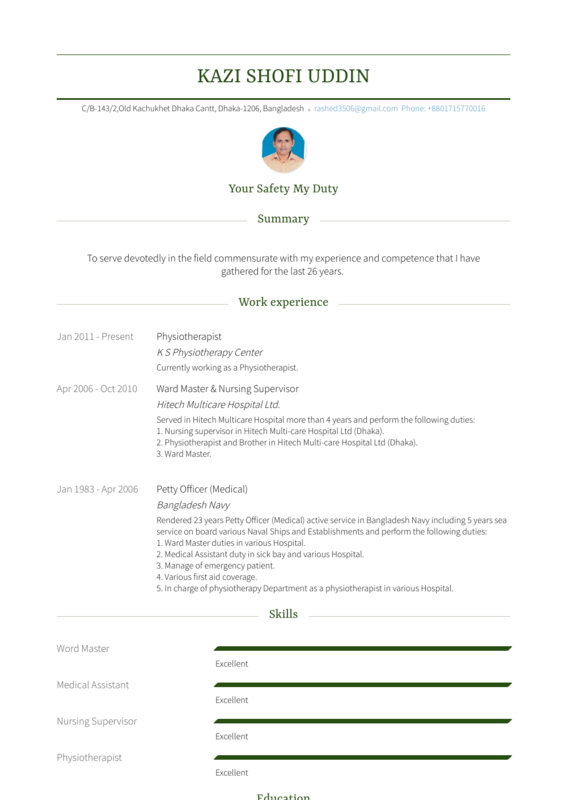 Get your physiotherapy resume to really shine with our specific resume templates. Join the other professionals who are using them to boost their career potential.